Erica Sionelo, then 13, chose to sink, and then swam to survive the storm surges of Yolanda. Erica, her sister Ella May, 11, and their 61-year old father sought refuge and higher ground at a neighbor's house when Yolanda came. When storm surges as high as roofs hit their Tacloban coastal village in Barangay 89, San Jose, Erica swam her way through and stayed underwater as long as she could. She avoided rubbles and floating objects, and kept swimming until she thought it was safe to come up for air. Her mother Sonia chose to stay behind in their house to get clean clothes that the children could wear after the typhoon. But she never made it out alive. Erica Sionelo says it was painful to lose her mother, but has resigned herself to this loss because she could not do anything about it. Erica, Ella May, and their father were separated but were eventually reunited. They never saw Sonia again. Neighbors and friends recalled seeing Sonia's body getting halved by the debris that got whipped by the storm. Erica's father Eduardo, a fisherman all his life, would never again set sail. In the coming years, he would get by with the support of his five other older children who either went to Manila or to neighboring towns in search of greener pastures before Yolanda happened. Ella May, who has difficulty speaking, never got to study. For the next five years after Yolanda, Erica would not know where her mother's remains were buried. She would be too busy either staying alive, or helping her father and Ella May live. IT WAS GOING TO BE A TOUCHSTONE OF THE FILIPINO RESILIENCE FROM THE MOMENT IT MADE LANDFALL NOVEMBER 8, 2013. Yolanda (international name Haiyan) was a west-moving catastrophic typhoon that killed 6,300 people in never-before-seen storm surges that reached as high as 5 to 6 meters, floods, and landslides as it sliced through eastern and central provinces of the country’s Visayas region. Five years after the typhoon, many in the Yolanda-devastated areas are still trying to rebuild their homes and families, some having to deal with the loss of everyone and everything that mattered to them, being forced to start their lives from scratch, and fighting for their very survival. Months after the Yolanda onslaught, Tacloban City, Leyte -- ground zero of the devastation located 880 kilometers southeast of Manila -- redid its maps in a bid to prepare for never-before-seen effects of a devastation, such as Yolanda. The Sionelo family faced uncertainties after Yolanda. But it was not something they did not have to deal with before. Erica’s family, the Sionelos, belongs to the category of typical Filipinos in the regions devastated by Yolanda who relied on agriculture, fisheries, and tourism for their livelihood. The year before the typhoon, the average household income in the severely affected provinces was only 75 percent of the national average, said the Yolanda Comprehensive Rehabilitation and Recovery Plan (CRRP) – the blueprint for the Philippine recovery from the typhoon. The document cited data from the National Economic Development Authority. The poorest of these families actually earned P6,000 monthly, far below what they have to spend for their basic needs, according to 2012 Philippine Statistics Authority data. The CRRP warned against the danger of the impoverished getting mired further in poverty with the occurrence of Yolanda. “People from the affected regions have been relegated to an even worse poverty status. Thus, considerable interventions are required to bring the affected regions up to the development targets originally envisaged under the PDP [Philippine Development Plan] and to build back better wherever possible,” it said. The PDP is the government’s plan for reducing poverty, increasing jobs, creating equal opportunities, and ensuring a climate-resilient environment. It has a timeline pegged between 2011 to 2016. An updated version of this document would be drawn for 2017 to 2022, in time for the new administration’s term in office. But Yolanda washed out everything, including the very clothes people had on. When the waters subsided, they were hungry for days. They subsisted on whatever they could get their hands on: biscuits, dead animals and wet rice. Erica said she, Ella May, and Eduardo did the same and took what food they could to survive the first few days after Yolanda. Eduardo Sionelo, 66, remembers the birthdates of his seven children, including Erica, his sixth. But he has to catch his breath when speaking or walking. His hands would tremble, and his right eye and cheeks would flinch when recalling how he lost his wife. Grief and the smell of death hovered over the Yolanda-stricken areas in 2013. Five years after, memories of the massive loss of human lives lingered. Gil Alarcon, 49, of Barangay 63 in Tacloban, said he did not feel hungry two weeks after Yolanda. Unable to muster energy to queue for relief goods, he was contented with eating whatever he could get his hands on to sustain himself. Instead of thinking about his next meal, Alarcon helped his neighbors gather the dead in a pile that included his entire family: his three young children and wife. He would visit them in the mass grave every day until he learned how to busy himself with work. Gil Alarcon did not care much about living after he lost his entire family to Yolanda. He went by eating what he could find. Alarcon is not the same man after Yolanda. Every Undas after 2013, he would commission for a tarpaulin poster showing his wife and their daughter, one of his three children, from the only picture of his family he was able to save. He would post this on the crosses he marked for his lost loved ones at the mass grave at the Holy Cross Memorial Garden in Tacloban. Relatives remember their departed loved ones at the mass grave in San Joaquin Parish Church in Palo, Leyte during this year’s Undas. If you want to see what moving on looks like, you can try going to Barangay San Joaquin in Palo, Leyte. Its village chief, Papoose Lantojo, in his first term as barangay chairman in 2013, made every effort to account for missing residents. The community then gathered their dead, and provided a mass grave for those who perished in the San Joaquin Church grounds. 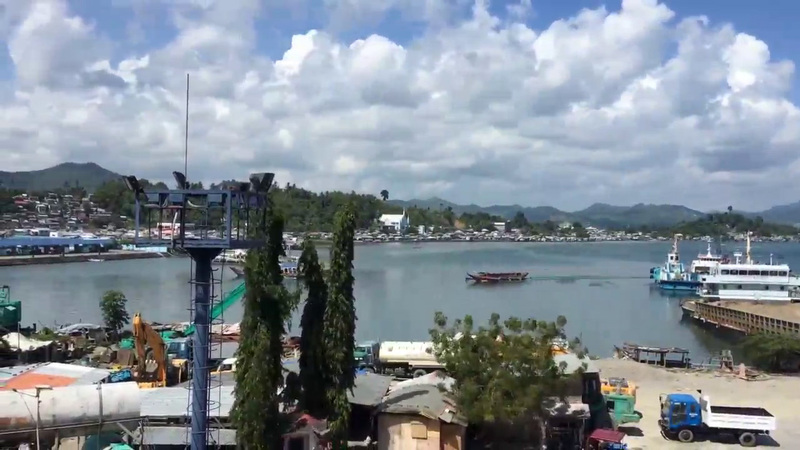 The barangay's population of 2,719 has benefited from relief aid and donation since, and San Joaquin is now back on its feet, with residents back to being fishermen and coconut farmers. Residents have benefited from the Department of Health's psycho-social debriefing, Lantojo said. They are also active participants of the barangay's disaster preparedness drills and preparations. In a recent evacuation practice, they were provided 12 trucks by the local government, and yet these were not enough to transport participating citizens, he said. The level of interest in disaster preparation is that high; nobody wanted to be left behind. For the faithful of San Antonio Mission Center in Basey, Samar, the Mass is a time to remember those who perished in 2013. Five years later, they are still praying for these loved ones. Across the San Juanico Bridge from Tacloban City, the people of Basey in Samar have moved on but they have not forgotten. They still take the time to remember those who perished during each Mass at the San Antonio Mission Center, especially the only one on Sundays at 7 a.m.
Father Noel Abiertas explained that the names he would read during Mass are those of the kin of the faithful who would each write down their relatives' names on envelopes containing "heartily given" donations. The litany of names is usually long, and contributes in no small part to the Mass lasting to an hour and a half. These funds have helped to rebuild the mission center after it was virtually wiped out by Yolanda in 2013. Now the center is on its way to being a parish, which means its priest could already perform and keep records of marriages, baptisms, and other acts of the Blessed Sacrament performed there. Like many other places in the Yolanda-stricken areas, faith has kept the community together in San Antonio. The priest said that he has noticed how his flock has been able to surmount bouts of loneliness brought about by the loss of loved ones. He attributes this to the people's ability to bond and find strength in each other. A July 2014 document outlining the phased implementation of local government units' rehabilitation and recovery plans after Yolanda estimated that it would take P168 billion to help 1.47 million affected families in 171 cities and municipalities. This document would evolve and be part of a comprehensive plan approved October 2014 encompassing disaster prevention, risk reduction and mitigation, and tackling areas such as proper land use to avoid communities' exposure to hazard areas. But the plan would not be fully realized due to funding problems, among other issues, audits of the Yolanda plan would reveal, and local government executives of the typhoon-stricken areas would admit four years later. About P63.8 billion was estimated for the resettlement of displaced citizens, the social services they needed, and help for them to regain their livelihood. But the problems from the social cost of the devastation appeared to run deeper, as "the typhoon’s impact is concentrated on some of the poorest provinces in the country" to begin with, said the Yolanda Comprehensive Rehabilitation and Recovery Plan (CRRP) of Sen. Panfilo Lacson, who was appointed rehabilitation czar for the typhoon-stricken areas by former President Benigno Aquino III December 2013. Lacson formally resigned February 2015, and turned over the project's reins to the National Economic Development Authority (NEDA), which was given this task as it was vice chair of the rehabilitation and recovery group. In an essay published in the Manila Times newspaper remembering his stint as presidential assistant for rehabilitation and recovery five years earlier, Lacson said government did not appropriate the needed funds for the CRRP, although it was widely supported by the private sector, non-profits, and multilateral agencies. The Yolanda plan was supposed to "build back better" – the rehabilitation battle cry – in four key areas: infrastructure, social services, resettlement, and livelihood. On January 6, 2014, classes in Tacloban City resumed, by virtue of Department of Education (DepEd) Order No. 10, s. 2013. Four days after, the DepEd reported a 91 percent student attendance rate in five affected areas: Samar, Leyte, Tacloban, Eastern Samar, and Ormoc City, with a 96 percent teacher attendance. These data were from a joint study on the Yolanda experience of the Philippines by the World Bank’s Global Facility for Disaster Reduction and Recovery, the United Nations Development Program and the European Union. The study aimed to come up with a guide for developing disaster recovery frameworks. After classes resumed, Erica Sionelo's then Grade 4 teacher, Liway Coralde, at the San Jose Central School, the biggest in Tacloban with about 3,000 students, wondered about Erica. The girl would seem to be in a constant state of shock, unable to speak, barely able to catch on with the lessons, hardly passing in class. Like Erica, many of the students lost parents, siblings, relatives; lost entire houses or livelihood. But Coralde was struck by Erica because she was unable to cope with her situation. Coralde learned about Erica's family, and figured the student would benefit from some guidance, even a foster family. She began to take Erica with her to her house. The next year, Erica moved up to Grade 5, and became a student of Coralde's sister, Gelyn Digdigan, who also took in the girl. Over the next four years, the houses of the Coraldes, the Digdigans, and even of their brother-in-law, Baptist pastor Edgar Tacata, and the entire family compound, would be second home for Erica. The family shared with her their food, and helped support her school needs; in return she would perform house work or run errands. Erica’s school experience is only one dimension of how education serves as an important capacity-building tool and mechanism for the poor in the Philippines. Five years after Yolanda, schoolchildren in a Tacloban relocation community make do with seemingly makeshift classrooms. During regular, non-disaster times, help for the poor are funneled through school-based feeding programs meant to improve classroom attendance and performance of students in public schools. In times of calamity, the classrooms serve as evacuation centers for communities. Classrooms consisted the most significant need for education, according to the NEDA-initiated paper Reconstruction Assistance on Yolanda-Implementation for Results or RAY-I4R. The RAY-14R was to be among the documents on which CRRP would be built. Another is the Reconstruction Assistance on Yolanda – Build Back Better (RAY), which served as basis for immediate government interventions in the affected areas and to be a document to facilitate international donor assistance. This document was presented to the international community in Manila on Dec. 18, 2013. In 2014, a total of P823 million has been transferred to DepEd regional offices for Yolanda-stricken school building projects under the Quick Response Fund. The QRF is a portion of the national budget's disaster risk reduction management fund to immediately help disaster-affected communities. DepEd used only P589 million, leaving P234 million unused. The Commission on Audit (COA) said this was due to late issuance of needed documents from DepEd Central Office. The late download or release of the QRF funds were blamed for the failure to immediately rehabilitate or repair the classrooms. COA recommended that DepEd officials ensure timely releases of Special Allotment Release Orders or SARO, a document authorizing agencies on specific purchases within specified periods. Auditors recommended releasing what may be equivalent to detailed authorization documents to the operating units so these may carry out the repairs, rehabilitation, or replacement of damaged school buildings and facilities affected by calamities. In the case of supposed P4.2 billion QRF in 2014, "delays in project accomplishments did not promptly address the repair/rehabilitation and construction of school buildings/classrooms and replacement of school furniture damaged by typhoons," COA said. The releases “awaited the completion of long and tedious process of procurement” before the sub-allotments could be issued. In the Eastern Visayas region, "DepEd staff attributed the poor performance to shortage of construction materials and bad weather condition," COA said. The delays in the release of funds that prevented the construction or rehabilitation of destroyed or damaged or classrooms were noted as well in the succeeding year’s audit report. The Samar provincial government reported in 2014 that Basey and Marabut sustained the most significant damage in the area in terms of educational facilities and assets due to Yolanda with the needed repair cost amounting to P311 million. One of these schools in Samar was so badly damaged that a high school teacher chose to spend his own money so that his classroom would have roof. Christian Piñeda, 27, just transferred to the Old San Agustin National High School in Basey, Samar in 2014. He was given an advisory class, but had no classroom. So he held classes in the makeshift room, a space between two single-storey classroom buildings being used as meeting area with parents or activity area for students. The Old San Agustin National High School in Basey, Samar does not have enough classrooms, and barely has roof for those it has. A year earlier, typhoon Yolanda destroyed the school’s classroom roofs and demolished three makeshift classrooms made of bamboo and coco lumber. The Department of Education helped in repairing some of the damage, but the demolished ones were not restored. The makeshift room that Piñeda has been using had no roof though, only provisional walls. He decided to use his own money to get the roof. 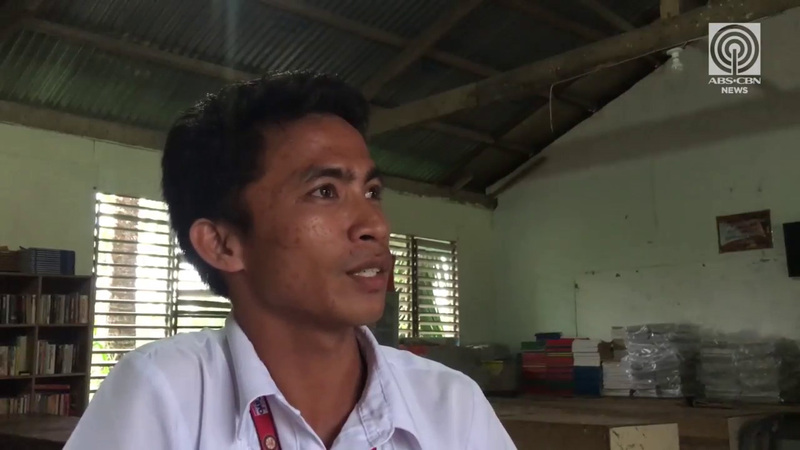 Teacher Christian Piñeda wishes for a lot of things: classrooms, lavatories, an activity area, a school stage -- things that would come easy for some schools, but not for his. The money was part of a bank loan that he took out to have his family’s home, also damaged by Yolanda, repaired. “This is my second home din naman, five days in a week nandito ako sa classroom. So kailangan maayos din ‘yung classroom ko,” he said. The school would later reimburse Piñeda for the expense. But he admitted that at the time he funded the roofing of the classroom, he was not sure his money would be returned. Now the classroom doubles up as the school library. But Piñeda and his fellow teachers wish the school would at least have more classrooms, an activity area, and functioning comfort rooms. The school would also get flooded whenever irrigation waters flowed from the farm beside it. Teachers and students remembered one Christmas party when floodwaters stayed up to the knee and everyone wore flood boots. The Old San Agustin National High School in Basey, Samar gets flooded even when the skies are clear. Emelyn Baculanlan, 43, was not able to save anything during Yolanda as the typhoon destroyed her family’s bakery and poultry businesses in Barangay Palaypay, Basey in Samar. Baculanlan went from having a bakery that served all kinds of bread and pastries, a dressed chicken delivery service, and a piggery, to having not a peso in her pocket. She prioritized ensuring the safety of her then 5-year-old son and 12-year-old daughter as her husband, a soldier, was unable to fetch them from their home when strong winds and rains came. She also worried about her old father who lived across the street. Baculanlan learned her husband got injured, and had to be hospitalized. Realizing she had to pick herself up to survive, Baculanlan took her children and her father to Manila through relatives’ help, and went back to Samar to care for her husband. She took him back to what’s left of her father’s home after he was discharged from the hospital. Things began to light up when a neighbor from the Samar electric cooperative offered to hook up Baculanlan’s home to the electric post so that her household would at least have lights. That was nearing Christmas of 2013. Baculanlan was pleasantly surprised when she learned people were willing to pay as much as P20 for each of their mobile phones or devices to be charged. People began paying Baculanlan to charge their devices because she was the only one who had electricity. She began saving money and would travel to Catbalogan to buy groceries or drinks that she sold to people in her village. But Baculanlan was able to get back her business after she rummaged through Yolanda’s ruins and salvaged what was left of her oven and other baking equipment. She had it repaired and restarted her bakery. Today Baculanlan also has a water refilling station, and a passenger van for rent. She and her siblings are planning to use the property across the street, where her pre-Yolanda bakery once stood, to start a gasoline station. They are consulting their lawyer how to go about starting this business, she said. The Baculanlans are back on their feet five years after Yolanda: They reestablished their bakery, and started new businesses such as a water refilling station and a van-for-rent. Not everyone has been as lucky as the Baculanlans. The Yolanda Comprehensive Rehabilitation and Recovery Plan (CRRP) envisioned a two-year transition from cash-for-work and other short-term livelihood programs to “skills enhancement and sustainable economic and livelihood initiatives” able to provide long-term employment for the people who survived Yolanda. This meant going from handholding the citizens, weaning them off the state support, and empowering them to start their own livelihood. It also envisioned the government agencies under the Yolanda CRRP Livelihood Cluster to focus on activities that will re-establish sources of income, increase opportunities for employment, and reinvigorate micro, small and medium enterprise development in the affected areas. But by 2014, the Livelihood Cluster was approved only a fourth of its total funding requirement of 33.68 billion. RAY-I4R said the aim is that sustainable incomes are restored or established for households and businesses adversely affected by Yolanda. Tacloban Vice Mayor Jerry Yaokasin is convinced his city’s workforce and businesses have been able to recover. "After Yolanda marami umalis. But now you go back in a normal day in Tacloban, you’ll see that mas maraming tao pa, mas traffic pa,” he said. Tacloban might have been lucky not to be dependent on agriculture, he said. "Tacloban City has always been a trading center of the region, so with the education hub, and all, so nakabalik na kami, recover, because hindi naman kami dependent on agriculture,” he said. Yaokasin calls attention to something called “disaster tourism,” where people visit out of curiosity over the aftermath of Yolanda. This brings in a lot of foreign researchers, for instance. “The tourists would tend to leave amazed, wowed by the way Tacloban looks now, and impressed at the city’s fast recovery,” he said. A typical day in Tacloban City which, 5 years earlier, was brought to its knees by Yolanda. As for agriculture, a total area of about 600,000 hectares of agricultural lands were affected by Yolanda, 80 percent of which were in Eastern Visayas. Affected crops were rice, corn, coconut, and other field and plantation crops. Remedios Barbasa literally built her house from scratch. At 70 years old when Yolanda struck, Remedios Barbasa of Barangay Mangga, Sagkahan in Tacloban was not sure how she would start over. She has been a widow since 1999, and living in the same place since 1971. She was with her two grandsons, then aged 16 and 10, and a granddaughter, then 17, when water began rising, and they sought refuge in a neighbor’s house. One of her five children fetched them after three days and brought them to Catbalogan. She decided to return to Tacloban after two weeks. Her house was barely standing. “Two to three months na may relief. Iyong apo kong babae nag-cash-for-work, P500 ang bayad doon araw-araw,” she said. The cash-for-work scheme is by humanitarian organization Tzu Chi, which launched a massive relief campaign to help Yolanda survivors immediately recover from their situation. Tzu Chi gave residents cash if they helped in the cleanup of the devastated city, even if this meant cleaning up one’s own backyard. Barbasa started collecting old and used woods still scattered around, and slowly built her house, paying people token amounts to help her whenever she got money from her children or grandchildren. She continued collecting scrap wood and roofs over the next months. The community got their electricity back March 2014, and her house was completed that December. Her neighbors were doing the same, repairing what they could and building back on the same place where their houses once stood. What people are amazed at is how Barbasa sustained her stamina in seeing her house to its completion. “Maliit pa ang mga anak ko, andito na kami; 1971 pa kami dito. Dito na ako tumanda,” she said. These days, Barbasa earns by tending a small store she started from ‘lending’. She pays the collector P200 daily for this. She said she will keep paying faithfully so she can borrow anew after she has finished paying her dues. Relocation sites in Samar and Leyte are peppered with houses in varying degrees of completion; some are occupied, and some are far from finished. Tacloban City had an ambitious recovery-future-development combination of a plan: proposing the creation of new development districts for new employment and residential area, a central business district, a transit and trading area with satellite government center, and a protected area. Housing projects of different shapes and sizes mushroomed all over Tacloban, even Samar. Yet many of these remained virtual ghost towns with houses in varying phases of completion. The Sionelos’ new home in Guadalupe Heights is one of many handed over to citizens sans electricity nor water, a serious concern that had many refusing to live in them. Erica Sionelo's foster family's home in San Jose, Tacloban is much nearer to her school than in the Guadalupe Heights socialized relocation project of the National Housing Authority (NHA) where her real family was transferred after Yolanda. This meant walking a total 12 kilometers to and from school during school days. But Erica made it a point to go home every day, and just visit her foster family’s compound when there are no classes, during Sunday services, or when she should help with the housework. Like many from the Tacloban coastal villages who have been transferred to the NHA projects, Erica worries about the lack of water in their Guadalupe home. She and her family would either have to fetch water or depend on the rationed supply. It's a good thing one of her sisters gave them money to pay for electricity, she said. At least her father Eduardo and her sister Ella May are able to watch television. The absence of water and electricity in the new houses, along with the distance to places of livelihood and children’s schools are making people resist the move to the new houses. This is true even for those staying in declared ‘danger zones’ in post-Yolanda land zoning who have refused to leave. The local government of Tacloban City, for instance, is standing by a handshake agreement with residents lining the coastal areas who built back their houses on spots wiped out by Yolanda. The city government has agreed not to force them to the new houses provided the citizens heed and evacuate immediately should there be a firm order to do so in case of a hazard warning. For now, 36 barangays with about 3,000 people each live in this area. Of the 14,433 housing units targeted by the NHA in Tacloban for the new houses, for instance, about 8,900 have been occupied, according to the findings of the City Housing and Community Development Office. There is now a continuing effort to validate the figures and clean up database, officials have said. But the absence of piped in water or electricity in the new houses appear to be caused by a number of reasons. There is the long and arduous task of securing permits to build alone. Despite the mandated 110 days for the process of clearing an area for building and finally giving the development permit, NHA said it has been facing as much as 646 office days (1 year, 9 months, 1 week). There was an instance when a failed bidding for the water supply system for the Yolanda resettlement area in the Tacloban North in 2017 has resulted in the re-bidding taking place only last September. This threw the entire water project for the housing units off-track because the contract was only approved Nov. 7, 2018. Finally, there is the issue of money. Fund releases came in trickles. WHAT HAPPENED TO THE PLANS, THE MONIES? Senator Panfilo Lacson's comprehensive Yolanda recovery plan had aimed to enable the Philippine government and numerous international non-governments to immediately help the likes of Erica Sionelo. The Lacson plan noted its "major cross-cutting goal is the stimulation of the economy with a concomitant reduction in poverty from pre-Yolanda levels," which meant avoiding having an impoverished Visayas from worsening because of the effects of the typhoon. "All rehabilitation and recovery projects and programs, both in their design and in their implementation, must ensure that greatest consideration is given to stimulating the economic recovery of the affected areas and to do so in ways that contribute to reduction in levels of poverty," the Comprehensive Rehabilitation and Recovery Plan (CRRP) said. On the fifth anniversary of the Yolanda onslaught, Lacson said “most of the infrastructure projects such as hospitals, housing units, and school buildings came from donations from the private and business sectors both local and foreign,” with government failing to put money where its mouth was. By August 2014, government pegged the overall recovery funding requirement until 2016 to P171 billion, said a May 2015 multilateral paper on the government's Yolanda recovery efforts, the Typhoon Yolanda Ongoing Recovery-Recovery Framework Case Study. The paper was a joint study of the Yolanda experience of the Philippines by the World Bank’s Global Facility for Disaster Reduction and Recovery, the United Nations Development Program, and the European Union. The study aimed to come up with a guide for developing disaster recovery frameworks. Apart from this, the Philippines asked government agencies to reprogram existing budgets for 2015 to accommodate the Yolanda reconstruction needs, and explore the possibility of cancelling or deferring less urgent projects. But by Lacson’s narrative, there weren’t enough public funds to really help the Yolanda-stricken areas. The Typhoon Yolanda Ongoing Recovery-Recovery Framework Case Study, citing findings by the Commission on Audit on the Yolanda funds use, said there is need to simplify the process flow to allow local government units to avail of these disaster recovery and rehabilitation funds. There is also the challenge of taking quick action while being committed to transparency and accountability, it said. Rehabilitation efforts have also been dogged by the problem of coordination between the national and local governments, preventing the smooth download of funds and projects to the latter, or discouraging either side’s officials from coordinating and doing away with multiple layers of vetting, documentation, and processing of funds and projects, said several audits and studies on the Yolanda recovery and rehabilitation efforts. For local government executives like Tacloban City Vice Mayor Jerry Yaokasin, this translated to missed opportunities for Yolanda areas like theirs to "build back better" - the slogan the entire Yolanda reconstruction and recovery program was built on after 2013. "We could have been a little Singapore after 5 years because it was all flattened, we could have redone everything from scratch, from the ground, literally... Somewhere along the way we might have built back. But I cannot say we truly built back better kasi binalik lang eh," he said. He added: "We wanna build back better. But may pondo ba to do that?" For all who survived Yolanda, we will never be the same again. The scars will always be there. Until our last day here. "In every conversation that I go to, if previous we have the BC and AD, before Christ, after Christ, our life, when we talk in family conversations in the barangay, when we talk with the community, our experience is divided into before Yolanda, after Yolanda. Ganu'n ang usapan namin. Ano tayo before Yolanda, ano naman tayo ngayon, after Yolanda? That’s how we look at our life in Tacloban," he said. For now, Yaokasin is hoping that those who survived Yolanda will move past the experience, even as he recognizes that the catastrophic typhoon has changed everything. "I think we may have missed some of the opportunities. But hopefully it's not too late to really build back better," he said. Erica Sionelo got so close to her foster family that during this year's Undas, they took her with them to the Holy Cross Memorial Garden in Tacloban to visit the burial plot of the family patriarch. They told Erica to visit her dead mother at the mass grave, the first time after 2013 when she would be able to do so. The bereaved pray for their loved ones October 31, 2018 at the Holy Cross Memorial Gardens in Tacloban, where the identification of possibly more than 3,000 people who have perished still face dim prospects, preventing families from giving them proper burial and from obtaining emotional closure for themselves. She could not explain why she or her family had been unable to visit her mother's grave. All she could say was that she only has her father, now old and sickly, and her younger sister who is having difficulty speaking. She said all her siblings are working far away, and there had been no opportunity to visit the grave. Eduardo, Erica's father, said he had gone to the mass grave during the Undas of 2016 and marked the cross of his wife. Unfortunately, all the wooden crosses have been replaced with cemented ones by this year, removing all the previous identifying marks families made to symbolically set apart their loved one's place. All Erica knew was that her mother's symbolical cross is near a pathway between rows of crosses in the cemetery, because this was what her father had told her. But Eduardo has been unable to move around over the last five years to show Erica the actual plot; and even if he could, he would have limited money to spare to travel with her daughters to the mass grave. The father and daughter finally decide to light a candle for her mother Sonia in front of an unmarked cross in the mass grave around the area Eduardo estimated he had marked in 2016. Erica said she is very happy. Erica and her father Eduardo are finally able to pay their last respects to Sonia, mother and wife, five years after this perished during the Yolanda onslaught. Erica admits her father could be forgetful sometimes, maybe even stubborn, refusing to admit if he feels sick or weak. Someday when she fulfills her dream to be a seafarer, she will not forget her father and will keep helping him in his old age, Erica said. Kailangan ko pa rin siyang tulungan. Di ko siya pababayaan. She also promised to remember the symbolical resting place for her mother so she can bring her family to the mass grave next year. Photos from 2013 by Fernando G. Sepe Jr.